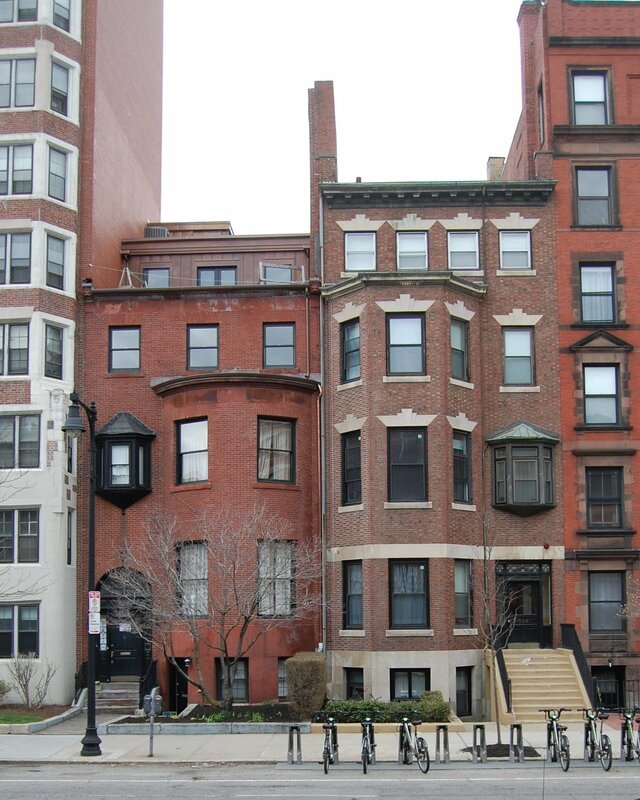 508 Beacon is located on the north side of Beacon, between Massachusetts Avenue and Charlesgate East, with 506 Beacon to the east and 512 Beacon to the west. 508 Beacon was designed by Shaw and Hunnewell, architects, and built by Hezekiah McLaughlin, mason, in 1890-1891 for Thomas Nelson. He is shown as the owner on the final building inspection report, dated October 1, 1891. He purchased the land for the house on June 2, 1887, from the Boston and Roxbury Mill Corporation. Click here for an index to the deeds for 508 Beacon. 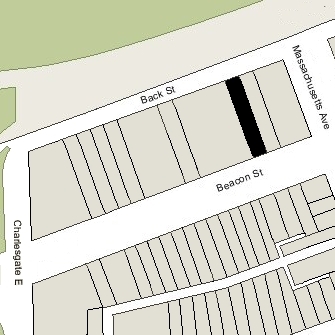 On February 24, 1890, Thomas Nelson entered into an agreement with the other owners of land on the block limiting (until January 1, 1905) the depth of any new buildings to 90 feet from the north line of Beacon (with bays and other projections limited to extending another 5 feet), and limiting the height of stables and other ancillary buildings further north to no more than 12 feet in height. The agreement probably was prompted by construction of The Austerfield at 7-9 Massachusetts Avenue (502 Beacon). It was the only building on the block and its north façade extended to Back Street. Thomas Nelson and his wife, Annie (Bigelow) Nelson, lived at 128 Marlborough during the 1890-1891 winter season. She died there in March of 1891 giving birth to their daughter, Anne Victoire Adelaide Nelson. Thomas Nelson and his infant daughter moved to 508 Beacon by the 1891-1892 winter season. A former real estate dealer, Thomas Nelson was treasurer of the Boston and Montana, Tamarack, and other mining companies. Thomas Nelson died in November of 1897. After his death, 508 Beacon became the home of his niece, Margaret H. Nelson, the daughter of his brother, Rev. Henry W. Nelson. She cared for Anne Nelson. They continued to live at 508 Beacon during the 1899-1900 winter season, but traveled abroad thereafter. By 1904. they were living in an apartment at 330 Dartmouth, and by the 1909-1910 winter season were living at 272 Marlborough. By the 1899-1900 winter season, 508 Beacon was the home of Charles Chapin Wheelwright and his wife, Laura Snow (Tower) Wheelwright. They also maintained a home in Cohasset, which previously had been their year-round residence. He was treasurer of the The Proprietors of Rowe’s Wharf Corporation. On April 10, 1902, Charles Wheelwright purchased 508 Beacon from Thomas Nelson’s estate. The Wheelwrights’ son, Josiah Wheelwright, lived with them. He was owner and manager of the Atlantic Electric Company, manufacturers of electric motors. He married in October of 1926 to Lois Curtis Nelson of Chicago; after their marriage, they moved to an apartment at 512 Beacon. On February 9, 1909, Charles Wheelwright purchased the vacant lot at 510 Beacon. On March 29, 1912, Charles Wheelwright and the other owners of property at 506-532 Beacon in an agreement reinstating the restrictions in the 1890 agreement (which had expired in 1905) and extending the limitations on the depth of buildings and height of structures in the rear yards until May 1, 1932. Although many of the lots had been developed by 1912, there remained vacant lots at 510 Beacon, 514-516 Beacon, 520-522-524 Beacon, and 534 Beacon. The agreement probably was prompted by the impending construction of the Van Cortland apartment building at 520 Beacon. On December 15, 1915, Charles Wheelwright transferred 508 Beacon into his wife’s name. On December 13, 1924, he sold the lot at 508 Beacon to Maryland Apartments, Inc., which also purchased the house at 512 Beacon and the double vacant lot at 514-516 Beacon. 512 Beacon subsequently was razed and the Maryland Apartments at 512 Beacon were built on the combined lots. Laura Wheelwright died in May of 1936. 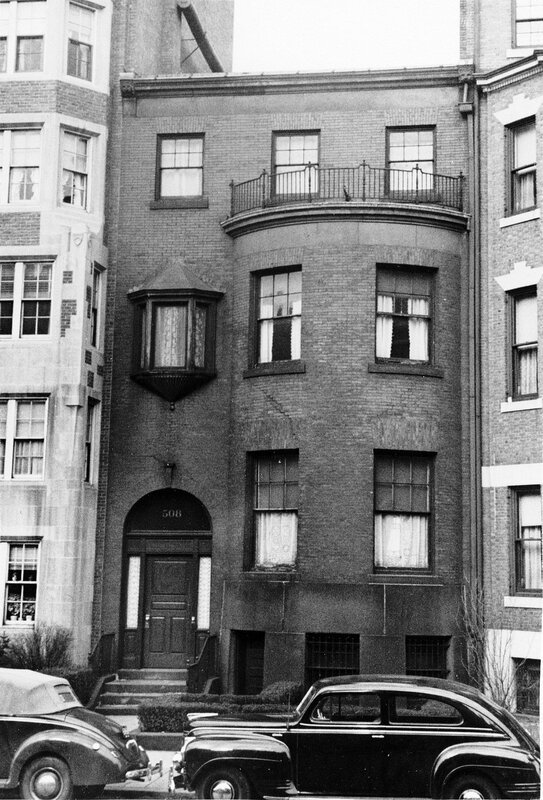 508 Beacon was inherited by Josiah Wheelwright and, on May 17, 1937, he transferred the property to his father. Charles Wheelwright continued to live at 508 Beacon and in Cohasset until his death in 1954. On July 9, 1954, 508 Beacon was acquired from Charles Wheelwright’s estate by Robert C. Nordblum, Rodger P. Nordblum, Albert V. Danielsen, and Jessie B. Danielsen, trustees of the Maryland Buildings Trust, which owned the Maryland Apartments at 512 Beacon. That same day, the Maryland Buildings Trust sold the property to real estate dealer Thomas J. Diab. In the deed, the trust included language, for the benefit of their property, specifying that 508 Beacon could not be used for a lodging house, rooming house, or fraternity house, nor for the sale of food, groceries, or liquor, nor for the conduct of a laundry business. In May of 1955, Thomas Diab applied for (and subsequently received) permission to remodel the property from a single-family home into eight apartments. In July of 1955, he amended the permit to remove the front apartment on the basement level and replace it with an office. Plans for the remodeling, designed by architect Leon L. Furr, are included in the City of Boston Blueprints Collection in the Boston Public Library’s Arts Department (reference BIN R-169). On June 1, 1956, 508 Beacon was acquired from Thomas Diab by Joseph J. Pritchard and his wife, Doris (Simon) Pritchard. They lived in Belmont. On June 1, 1961, 508 Beacon was acquired from the Pritchards by Miriam (Nurenberg) Brower, the wife of Dr. Thomas Brower, who held a 75 percent interest, and Nathan R. Miller, a real estate dealer and developer, who held a 25 percent interest. 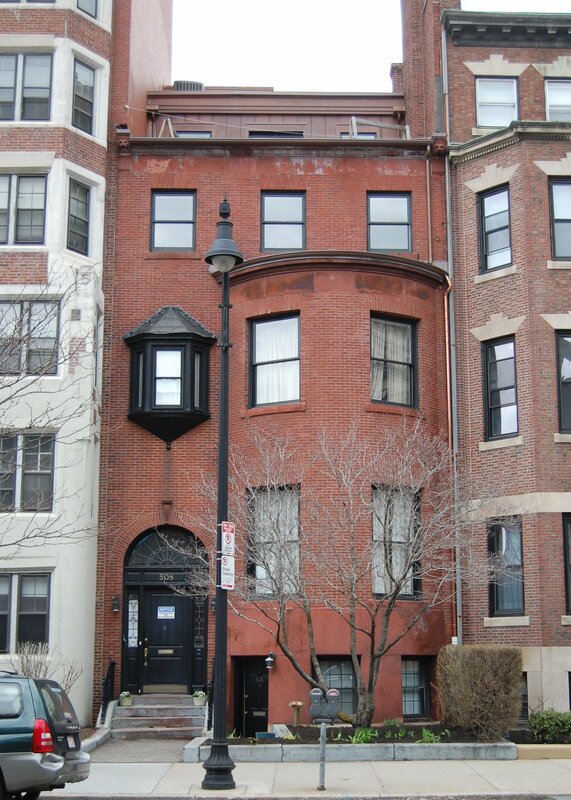 The property subsequently changed hands and on January 4, 1995, was acquired by Anna N. P. Shine, trustee of the 508 Beacon Street Trust. In October of 1994. prior to acquiring the property, she filed for permission to convert the property from eight apartments into a dormitory for 32 students, with one apartment for the caretaker. The application was denied and her appeal was dismissed by the Board of Appeal on May 9, 1995. In January of 1999, she applied for (and subsequently received) permission to convert the property into three apartments, noting that this was the existing condition and no work was required. On July 26, 1999, Anna N. P. Shine transferred the property into her own name. In December of 2004, she filled for permission to increase the number of apartments from three to nine. She subsequently modified the application to reduce the proposed number of units to six. The application was denied and her appeal was dismissed by the Board of Appeal on August 8, 2006. 508 Beacon remained a three-family dwelling in 2018.